THE City Government of San Fernando led by Mayor Edwin Santiago together with the Kaganapan Executive Committee headed by Ferdinand Caylao on Monday, January 28, kicked off this year’s Kaganapan or cityhood charter celebration by unveiling the calendar of activities at the city hall. 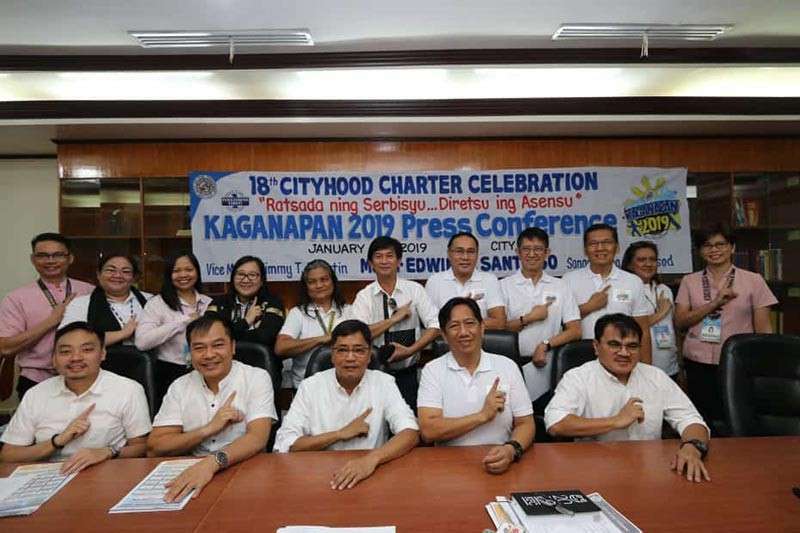 Santiago disclosed that this year marks the 18th year of the city’s Kaganapan, which began on February 4, 2001, the day the city officially became a component city following the approval of Republic Act 8990 in a plebiscite. San Fernando was branded as the 99th city in the Philippines. “This celebration is for all Fernandinos, who are worth thanking and serving. This is the month when we all celebrate the city’s number one position with our hearts. We are inviting everyone to become one with us and enjoy the activities we’ve organized since they are our number one priority,” Santiago said. Santiago noted that this year’s theme is “Ratsada ning Serbisyu, Diretsu ing Asensu” #MipanyadsadAlangTitiplad. “The theme manifests our mission in providing excellent public service to our constituents. Our goal is to be a model city of countryside development through effective and socially inclusive governance that will enhance every Fernandino’s quality of life,” Santiago added. The activities include the Teachers’ Heroism Day on January 31; Kaganapan Citywide Sale on February 1 to 15; Citywide Clean-up Day on February 1; Padyak Para Sa Kalusugan at Kalikasan and CLRAA Participants Send Off on February 2; GongXi Facai: Chinese New Year Celebration, Experience China Exhibit, and Spring Festival Concert on February 3 to 9. There will be a Thanksgiving Mass and Multi-Sectoral Assembly and The Outstanding Fernandino Awards 2019 on February 4; launching of the City Civic Center on February 6; Cityhood Agri and Trade Fair on February 6 to 9; Refill Revolution and Cityhood Job Fair on February 8; Pet Mo Show Mo, Rabies Forum, and Inter-Barangay LGBT Festival of Talents on February 9. There will also be a Market Summit and launching of Urban Gardening-Subdivision on February 11; Farm Link on February 12; Harana (Tribute to Empowered Fernandino) and SM Foundation Inc. “Gamot Para Sa Kapwa” Medical and Dental Mission on February 13; Farmers’ Day on February 14; Kasalan King Balen on February 14 to 15; Zumba Marathon on February 15; Motorcade and Opening of Inter-Barangay Basketball Tournament, Kayanakang Fernandino Concert and Dance Contest, and Launching of Joint Fire and Rescue Olympics on February 16. Other activities are Fernandino E-Sports Cup Assembly and Fernandino E-sports Tournament on February 16 to 17; Seniors Day Out on February 18 to 22; Parenting Seminar of ECCD Parents on February 19; Parenting Seminar of School-based Parents on February 20 and 26 to 28; Blood Letting Project on February 21; Employees’ Day (E-Day), Sports Fest Kick-Off and Lakan At Mutya Ning City Hall on February 22; Traffic Summit on February 23; and Me-Negosyo on February 26.